The IAM pledged $1 million to support “Vote No on Prop A” – a multi-million dollar effort to repeal Right to Work in the state of Missouri. The Machinists presented Missouri AFL-CIO President Mike Louis, third from left, with a check for $250,000 back in February. IAM Midwest Territory General Vice President Philip J. Gruber, left, presented Louis with another $250,000 Monday. The remaining half-million-dollars will be used to cover boots on the ground. 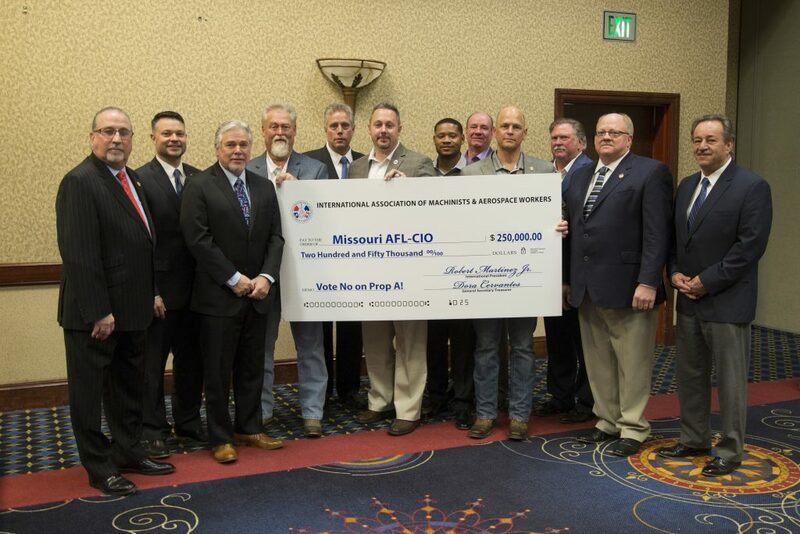 The International Association of Machinists and Aerospace Workers (IAMAW) have announced a $1 million pledge to support “Vote No on Prop A” – a multi-million dollar effort, headed by the Missouri AFL-CIO, to repeal Proposition A, a Right to Work law in the state of Missouri. The Machinists presented Missouri AFL-CIO President Mike Louis with a check for $250,000 back in February. Gruber presented Louis with a check for another $250,000 Monday. The remaining half-million-dollars will be used to cover boots on the ground – dedicated IAM members and staff teaching and educating the public, said Gruber. A vote “No” on Proposition A would repeal the state’s Right to Work law, suspended in 2017 after Missouri labor unions collected 310,567 signatures to halt the legislation and push it to a vote by Missouri residents. The measure is scheduled to be voted on November 6, 2018, unless state legislators vote to set an earlier election date. See photos from the 2018 Missouri State Council of Machinists/Joint Legislative Conference. See photos from the Missouri “Vote No on Prop A” rally.